I left Liverpool Express 1980 to get a proper job as a service engineer (fruit machines, videos, pool tables etc.) 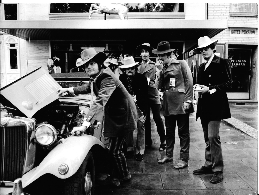 The Band had lost its way a bit, Roger Craig left a year later to move to America. My wife Irene and I had three kids by then Kevin, David and Jeanette. I have only played occasionally since then, with various local acts. I now play with Vince Earl (ex Comedians TV series and Brookside a channel 4 soap) the odd function or fund raiser. I will never forget my time with The Hi Fi’s from 1967-1969, based in Hamburg. What a wonderful time to be there, it really was fab. I loved every moment of time with those lads. Every year Vince Earl puts on a Rock-n- Roll weekend in Llandudno at the end of January, bands on every night for 3 nights. Two years ago January 2010 Mike Douglas & Razzle Dazzle played there. Wonderful to see him again, not changed at all, an unforgettable character, a lovely Man. I was born 11th June 1946 in Liverpool and went to my local junior school, St Aloysius in Huyton, then aged 11 into West Park Grammar in St Helens leaving at 15. I started playing around this time due to a birthday present of a cheap Spanish guitar, purely because of The Shadows and the “Play in a Day” book by Bert Weedon. My first group The Hungry I’s included Peter Kilfoyle on bass, who became an MP for Walton, Liverpool . We played weddings and local church halls including the Cavern. However the first proper group was The Corsairs. Line up; Pete Bowden (Bass), Ray Dale (rhythm), Colin Sayers (drums) and Tony Coates (guitar) with all of us singing. Played all the local venues, from March 1965 to May 1966. Joined Mark Peters & The Method Line up; Mark Peters (vocal) aka Peter Fleming , brother Steve Fleming (keyboards), Tony Sanders (drums), Pete Ritson (bass) and Tony Coates (guitar). We went to France in May; Gigged all over France till October, returning to a residency at the Kingsway Casino in Southport. 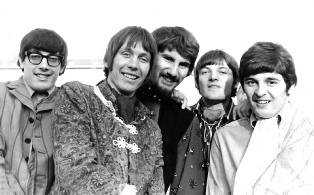 The band folded in March 1967. Star Club, The Hi Fi’s were on playing The Beatles, Paperback Writer. This made me want to go home. 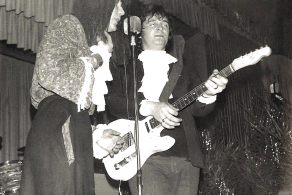 With many gigs all over Germany, but always returning to the Star Club, in June 1967 Ian Edwards had to return home, as his pregnant wife Betty was in hospital, so the band folded. I was stranded in the Block Hutte (a favourite drinking bar near The Star Club) , when in walked Mick Douglas from The Hi-Fi’s looking for a guitar player. Malcolm Lenny had just left. I played bass with The Zodiacs so had to use Mick’s guitar. I was in heaven, my kind of music, my kind of people, a wonderful band. At the Star Club we played on the same bill as Jimi Hendrix, The Maze (who became Deep Purple) and many top sixties acts, everyone wanted to play the Star Club. We returned to England in the autumn 1969. The Hi-Fi’s had been in Germany a long time, much longer than me. I returned to Liverpool and got married, because the rest of the band lived around London it just petered out .Sadly the last gig was in Yorkshire (place and date can’t remember) in the snowy winter of 1969. Then I played in a band called Paper Chase; Line up Pete Bowden(bass), Billy Ennis (guitar), he is the brother of Ray Ennis (The Swinging Blue Jeans), Derek Cashin (drums) and Tony Coates (guitar), in Liverpool for most of 1970, delivering milk as a daytime job. Spoke to Tony Crane (The Merseybeats) looking for gigs, he asked did I want to play with them on bass as Billy Kinsley had just left again.. We Played everywhere 1971 till 1974 , the line up then was, Derek Cashin (drums), Roger Craig (keys), Tony Coates (bass) and of course Tony Crane (lead guitar/vocals). The original Merseys (a seven piece band had reduced to 3 piece by 1969), then reverted to name of The Merseybeats.